We know we said $100 for a WP7 device from AT&T is a pretty good deal, but this looks even better. Up until Monday November 15, Amazon is having a sale on a number of handsets, including AT&T’s HTC Surround and LG Quantum. No sign of the Samsung Focus, probably because Amazon has sold out of the handset. Just be quick, it’s only good for this weekend. 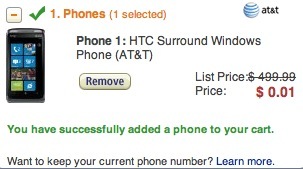 I just tried the upgrade route and it was going to cost $199.